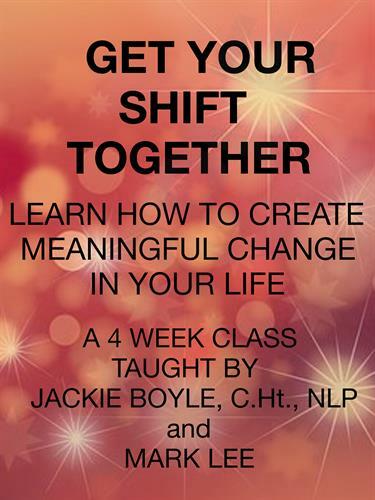 Awakening Natural Awareness Presents: Get Your Shift Together. Learn how to create meaningful change in your life. Taught by Jackie Boyle CHt, NLP and Mark Lee; this class will help you to enhance your health consciousness through a focus on current scientific findings, proven techniques, and discussions about healing the body and mind. We will meet once a week for 4 weeks, on Monday afternoons, as the class is designed to help you establish new patterns of health over a 30 day period.